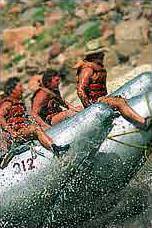 The secret is out that Cataract Canyon provides some of the best rafting adventures on the Colorado River. 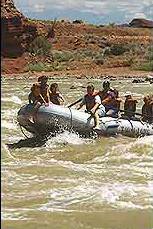 Tag-Along-Adventures offers a variety of multi-day rafting trips in this section of Utahs Canyonlands National Park. Our most popular trip is called Cataract Canyon Favorite, and for good reason. 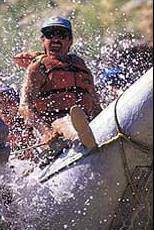 In only four days you experience 25 Grand Canyon-style rapids, 100 miles of river and Canyonlands National Park! This 4-day/3-night trip delivers everything you could want in a river raft adventure. Youll encounter rapids as intense as those found in the Grand Canyon. Youll take hikes into side canyons to enjoy hidden pools and waterfalls. You'll see 1000-year-old Native American ruins. Then theres time for swimming and relaxing on the riverbank as eagles soar above you. Today you will drift upon calm waters of the Colorado River as we wind through deep, red rock canyons. 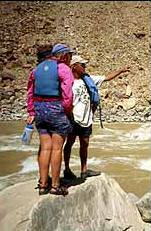 Your professional guides will discuss the natural history, and geology as you float along. Watchful eyes occasionally spot eagles, bighorn sheep, mule deer and coyote. Well stop for walks at several spots with views of petrified wood, geologic wonders and historical sites from the 1920s oil prospecting days. At noon, well find the perfect lunch site along shore and your guides will begin showing off culinary skills that youll continue to enjoy throughout your expedition. Late afternoon, we stop to set up our first camp in a picturesque spot near the river. Your guides will prepare a sumptuous dinner while you relax at the rivers edge. We continue down the Colorado River through Canyonlands National Park. Few people see the park from this perspective and its a memorable experience. Along the way youll see prehistoric Indian ruins built by the Anasazi, the same culture who built the amazing structures at Mesa Verde National Park. You may choose to take a hike over the Loop for a hawks eye view of the Colorado River or, you may just float along on the raft. After lunch on shore we reach the confluence of the Green and Colorado rivers, a magical place where two great Western rivers join forces before tumbling into Cataract Canyon. Just a few miles more downriver and we reach legendary Cataract Canyon. Today we encounter the first of 25 named rapids! Tonight you camp with the roar of the rapids in your ears! 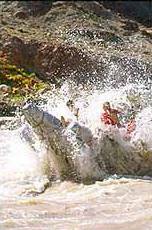 Youll begin the adventure of a lifetime as we encounter the big rapids of Cataract Canyon. These rapids represent some of the most well-known and respected whitewater in North America. As we descend the river, the rapids become more intense. Youll meet "Capsize," "Ben Hurt," "Powells Pocket Watch," and the three spectacular rapids of the "Big Drop." This is the steepest and most thrilling stretch anywhere on the Colorado River. This is the day youll remember your whole life. Tonight well camp near Lake Powell with moonlight reflecting off the water to recount the days events. After breakfast we cross stunning Lake Powell, a red rock and blue water wonderland. There will be time for swimming, relaxing, and absorbing the raw beauty of this country. 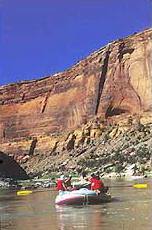 We arrive at Hite Marina by mid-afternoon where you embark for the return trip to Moab. You may choose to board the scenic air flight back to Moab. The flight takes you up the Colorado River above the rapids youve just run and over Canyonlands National Park before landing at the Canyonlands Airfield in Moab. 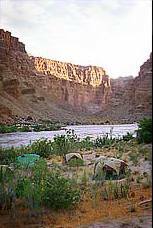 When you arrive you will have experienced first hand why the secret on Cataract Canyon is out and why these are considered John Wesley Powells rapids! While these trips are the ultimate in wilderness expeditions, all Cataract Canyon trips are designed with comfort and pleasure in mind. We dont want you struggling with tent poles that collapse into a heap, or sleeping on rocky terrain that plagues your back the next day. With Tag-A-Long Expeditions, youll enjoy self-erecting tents and sleep on cushy mattresses while snuggled in name-brand sleeping bags. On all J-rig trips, we bring along tables and chairs to make your wilderness dining experience as enchanting as that of your favorite restaurant as the Colorado River flows by. On the slower, flat water stretches of the river, you wont bake in the desert sun unless you want to. Shade canopies are placed over J-rig rafts to protect you from the suns harmful rays. Its this extra measure of care that sets Tag-A-Long apart from its competitors. Concerned about private matters in the backcountry? Private, tented toilet facilities take the worry out of wilderness life. Remember, while in the backcountry with Tag-A-Long Expeditions, you are in the care of professional guides who are sensitive to your concerns and trained in wilderness living and medicine. There isnt a question they havent heard or a need that they wont try to discreetly accommodate. Call 1.800.453.3292 or visit www.tagalong.com for information, availability dates, and reservations.